Med Hatters sure know how to step up. Breyden received such a great welcome on his 2 day stay there, it was incredible. 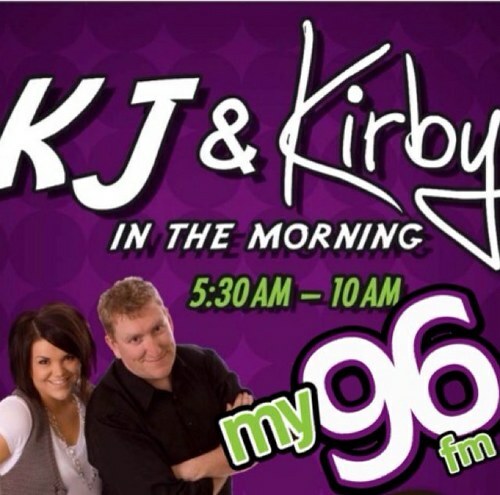 Firstly I'd like to thank Kim Johnston of Medicine Hat's My96fm's KJ and Kirby in the Morning Show. He had Breyden on their show last Thursday morning for an interview. Breyden had been walking till about 9:30 the night before and then up for the 7:30 am interview so he was quite tired but Kim was awesome. Look for an upcoming blog post for a photo montage Byron has attached to the audio of the 6 minute interview. Thanks also Kim for all of the promoting you did for Breyden and challenging Med Hatters to make some donations to the expenses. They really came through as you will see. A few days before Breyden reached Medicine Hat I finally decided to utilize twitter to try to reach out to people in the upcoming towns to raise awareness of Breyden's amazing fundraising efforts and his upcoming arrival to their town. Almost immediately I connected with 2 incredible women who helped out so much in spreading the word around Medicine Hat. 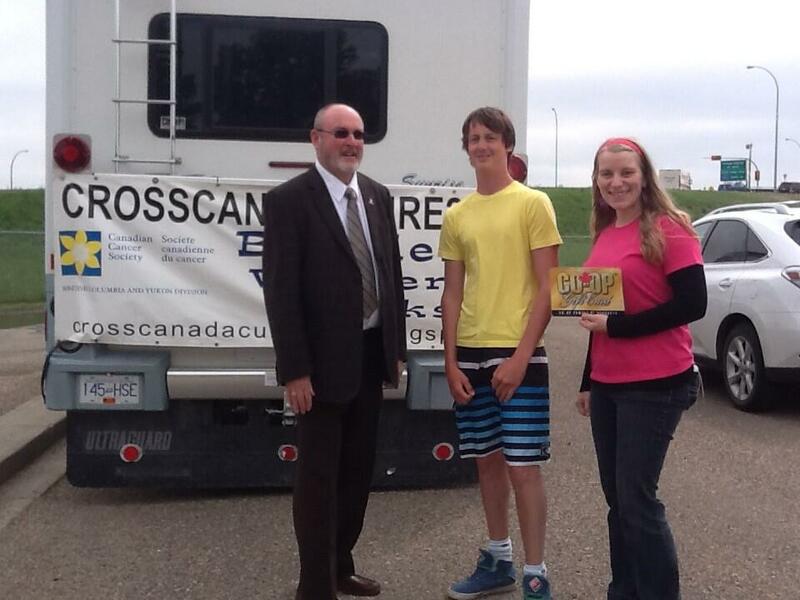 A huge thanks to Michelle Sauve of the Canadian Cancer Society of Medicine Hat. She reached out to all of her contacts and local merchants in Med Hat to rally support and donations. She was literally driving all over town to connect with people and helped to arrange a wonderful reception for Breyden at the Information Center where he met with acting Mayor Les Peterson. Michelle even took the time and effort to make homemade cookies to bring down to the event. Then, suddenly the incredible energy of Sherri Edwards of Kinetic Events Vancouver and owner of Swift Current Steel appears on the scene. Sherri also did an amazing job in spreading the word. Her energy and enthusiasm was highly contagious and really set the tone for the excitement in Medicine Hat. Oh and of course as always, a special thank you to Salmon Arm's Mayor Nancy Cooper. Salmon Arm is Breyden's home town and back in April Mayor Cooper met with him at city hall, presented him with a cheque and a pin to recognize all that he is doing. But she is continuing to help as an official member of TeamBreyden, working hard to spread the work to her counterparts and connections across the country as Breyden passes through each town across Canada. All this resulted in a great reception in Medicine Hat.Thanks to David, Manager of the Visitor Center for allowing the small crowd to use the Center to meet. Breyden and the whole team would like to thank Brian Kannekens of 'Bean There Roasting', who showed up with his coffee van to provide coffee for everyone. He also donated $100 towards new shoes. This, along with a generous discount from Intersport in the Medicine Hat mall enabled Breyden to get a much needed and appropriate pair of runners. And amazingly, a woman named Betty heard the Interview on the KJ and Kirby show and bought a pair of runners for Bryeden as well. Lisa Driver from the Co-Op came down and generously presented Breyden with a $100 gas card. VERY appreciated by the road crew! Breyden's grandparents are travelling with him using their motor-home as a support vehicle and donations towards expenses are graciously welcome. Have you seen gas prices lately! Ross from Chat TV was there and did an interview with Breyden as well which resulted in a write up on their web site. In addition to those mentioned, there were several other people who had heard about Breyden and showed up to give support. Gas City Campground provided the team with a two nights stay at the RV park courtesy of Parks and Recreation GM, Rodger Vizbar. Christina in Brooks heard about it and called Breyden a few days ahead to find out when they arrived and provided a spot for the RV with all the needed connections. Central Bow Valley School yard, plugged into one of their car plug outlets in the hamlet of Gleichen, Courtesy of the Principal Mrs. E. Mclane and the Maintenance Supervisor Don Hartman. I might add we are very grateful and appreciate the support. Another interesting thing today. When Breyden left this morning the headwind was very strong and it was raining quite hard, he was concerned that many would stop to offer him a ride. So he chose to go down a right angled side road, we drove beside him with the mother ship acting as a wind barrier. Three of the locals on the side road (Range Rd 232, Anonymous, Judy and Brenda offered $20.00 each towards the cause, thank you folks for your kind donations. There is always a bright side to everything if we look for it! So thanks again Medicine Hat and Alberta. You were amazing. Breyden is now on to Saskatchewan but all of us are very thankful for everything you did. I am sure I have missed someone so please leave me a comment if I did or contact me directly on twitter @TeamBreyden. This is the Support twitter account for the Team. Breyden also has his own @CrossCanadaCure account which he posts to but is often days between wifi.